...with No Wetted Elastomers or Metals! By-Pass: prevents pumps from "dead heading". 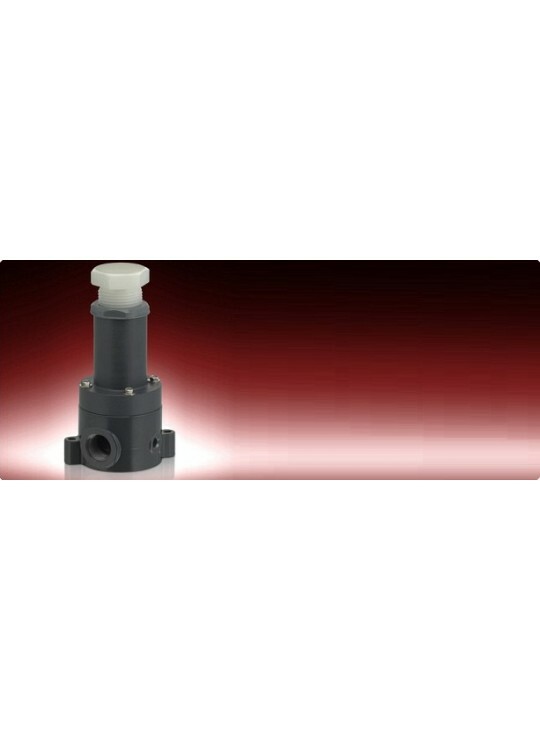 Back-Pressure Regulator: maintains necessary reverse pressure in closed loop systems. Anti-Siphon: used on the outlet of a pump wherever gravity or other downstream conditions may create negative pressure (siphon) and drain a tank. The valve is pre-set to open under pump pressure, but closes bubble-tight when the pump is shut off. Because of the design of the RVDT, this valveactually closes more tightly when unwanted siphon occurs. 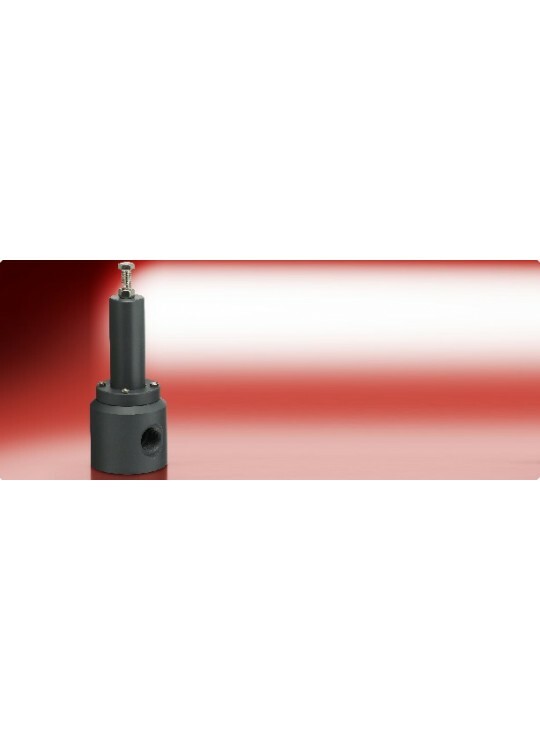 Geon® PVC, Corzan® CPVC, Natural Polypropylene, and Kynar® PVDF body materials in 1/4", 1/2", 3/4", 1", 1 1/2" and 2" sizes. PTFE body material offered in 1/4" - 1" sizes. Relief setting is infinitely adjustable from 5 psi to 100 psi. Maximum inlet pressure is 150 psi. Diaphragm material is PTFE for all sizes and body materials, and is excellent for use with highly aggressive liquids...provides the ultimate in contamination-free sealing. Rugged thermoplastic construction is ideal for a broad range of industrial applications. Large diaphragm area delivers more sensitivity and less pressure drop under flow conditions. Non-wetted u-cup seal provides a second isolation of the control spring; design includes patented Fail-Dry vent, a safety feature that provides visual warning of seal malfunction. This permits the valve to continue operation until a scheduled maintenance can be planned thereby avoiding a costly shutdown. Fail-Dry connection on Series RVDT is 1/8" FNPT. Non-leaching feature of fluoropolymer diaphragm makes it ideal for use with ultra-purewater and concentrated etchants, as in the semiconductor industry.